Wrocław z dwiema restauracjami North Fish Plus! 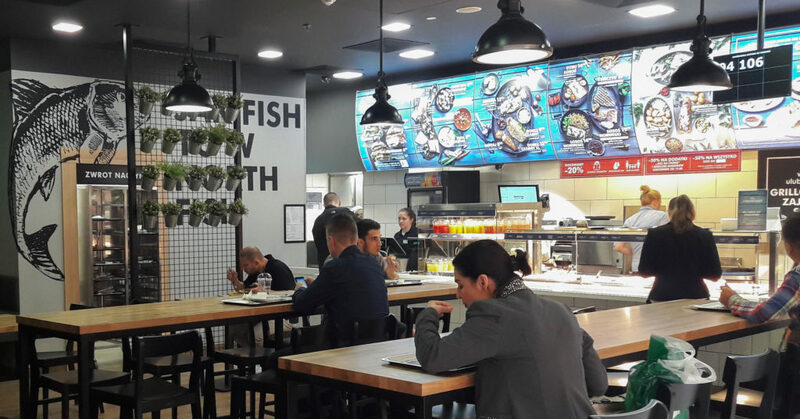 | North Food Polska S.A.
On Tuesday, May 16, in Dominikańska Shopping Centre in Wroclaw, North Fish restaurant had reopened. The restaurant gained a fresh look, has been redesigned to North Fish PLUS format, which means you can now choose any fish from an eye-catching ice counter and watch the chef grilling it for you. But that’s not all. New species of fish have come to our restaurants, for example zander and halibut. North Fish at Dominikańska Shopping Centre is one of three restaurants in this city and also second in the new format. North Fish is a chain of restaurants specialising in fish and seafood. The first was opened in 2002 in the Galeria Echo shopping centre in Kielce. Currently North Fish operates 39 restaurants located in Poland’s best shopping centres, which makes it the country’s unquestioned leader and Europe’s third largest, chain of restaurants offering fish and seafood. Each day nearly 1,000 employees take care to ensure the highest quality of the products served.